Cooke Scholars frequently cite that the most beneficial aspect of our scholarship programs – beyond receiving up to $40,000 per year – is entering a community of talented, motivated, and supportive fellow scholars. 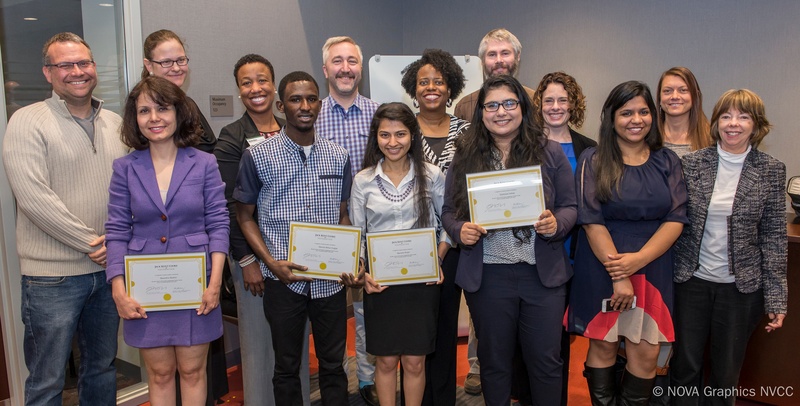 Earlier this month, we had the privilege of welcoming four new graduates of Northern Virginia Community College (NOVA) to the Cooke Scholar community. We were happy to share in the celebration as these four students matriculate to the next stage of their journey: Derrick Arthur-Cudjoe, Nooshin Bashiri, Shahrozia Imtiaz, and Manisha Khatri. Only 75 of this year’s 2,600 applicants were selected to receive our Undergraduate Transfer Scholarship and NOVA was one of only 11 community colleges nationwide with more than one scholarship recipient. The Cooke Foundation and NOVA are both based in the northern Virginia area and share many of the same goals to broaden college access. In April, NOVA honored the foundation with the 2016 Chancellor’s Award for Leadership in Philanthropy, noting support for the Pathway to the Baccalaureate program over the past decade. The Undergraduate Transfer Scholarship is available to community college students throughout the United States. The program allows high-achieving students with financial need to complete their bachelors’ degrees at the nation’s top four-year colleges and universities. Each scholarship is worth up to $40,000 per year to cover tuition, living expenses, books and required fees for the final two to three years necessary to achieve a bachelor’s degree. Cooke Scholars additionally are eligible for graduate school funding up to $50,000 per year for up to four years. The application for the Undergraduate Transfer Scholarship opens in October.